I regularly receive questions about dog training techniques and methods. Both in the comments on my websites, and in the emails that readers send to me. Some are short questions with simple answers, others are longer and rather more complicated to address. As you can imagine, there is a ‘core group’ of questions that are raised time and again by worried or stressed owners. People that may be struggling to make sense of some aspect of their training or that need to understand where they are going wrong. What methods do you recommend? 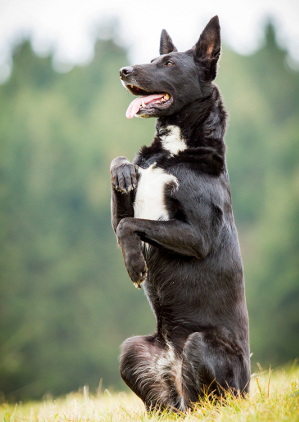 We teach dogs to recognise that the cues or signals we give them are associated with specific actions. Your dog is actually learning a foreign language.But dog training goes further than just understanding what a word means. Your dog also learns to respond to a word or signal with a specific behaviour. I recommend that you use the latest science based training techniques to train your dog to respond to your cues or signals. You’ll find lots of information about these methods on this website. How do these methods compare with others? Modern dog training teaches new behaviours before linking them to a cue or signal. The new behaviour is generated through luring, shaping or capturing. All processes which dogs find highly rewarding and free from stress. This means that they learn rapidly. Traditional dog training teaches dogs by telling them the cue or signal at the same time as building the new behaviour. The new behaviour is generated by manipulation or force (pressing the dog into a sit, moving the dog around with a lead etc). This is a slower process as the dog finds manipulation stressful and distracting. Positive Reinforcement Training is the formal term for the modern, science based approach to dog training now recommended by experts worldwide. It uses a happy consequences to make a behaviour more likely to be repeated. Not only this, it generally excludes the use of punishment. This article explains in more detail: What is positive reinforcement training? So does positive dog training work? Some traditional trainers find it difficult to understand how training without punishment can work. So one of the things we look at on this website is evidence and examples of how this training works in the real world. You can find out more in this this article . What is a clicker and do I have to use one? A clicker is a device which makes a distinctive sound. In science based dog training we use this sound to let the dog know the exact behaviour that will be rewarded. We call this an event marker. You don’t have to use a clicker if you don’t want to. You can use a word like YES or GOOD. But it is easier to be consistent and clear with a clicker. Is my dog becoming dominant? The answer to this is almost always “No”. It is no longer thought that dogs are interested in dominating people, and we now know that dominance has no relevance to dog training. Will food rewards spoil my dog or make him fat? Make sure that you deduct the amount of food you use in training from his daily food intake. This will ensure he is not over fed. When can I phase out food rewards? Giving frequent rewards is very important whist a dog is still getting to grips with a new skill. Over time, rewards can become more intermittent. Evidence shows that dogs will work harder for unpredictable rewards, but we have to be careful not to make rewards too infrequent or behaviours may become unreliable. You can read up here on how to fade rewards effectively. My dog knows what to do, why is he ignoring me? It is very frustrating when your training efforts fall apart. This tends to happen when we give known commands in new locations, or when dogs are distracted by other dogs, people, ball games, squirrels etc. Proofing is the means by which we teach a dog to obey a command under lots of different circumstances. Unfortunately many dogs are never put through any kind of proofing process. And consequently are doomed to be naughty at regular intervals.